Funerals celebrate the life and personality of our deceased loved ones. Here at St. George’s, we can offer you a range of formats, from the short, simple, quiet private occasion to the celebratory service of thanksgiving with a church full of people. If you are thinking of having a cremation service, you can also have a service either before or afterwards in church. Music, hymns and readings can play a big part in our services, and you can choose these in discussion with either the vicar or one of our Lay Ministers. Normally, we would be contacted by the Funeral Directors, for anyone who has died from this parish. However, if the deceased did not live here but has a connection and you would like to use St. George’s, you may ask to come here. We have many events and services at St. George’s, so cannot guarantee your choice of date and time, but will do our utmost to accommodate you. Please don’t make any other arrangements (eg: catering / venue / newspaper announcements), until the date and time has been confirmed. 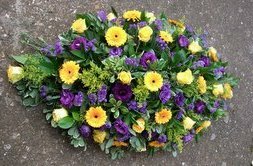 We can offer help with choosing Funeral Directors too, if necessary. If you would like help in planning your own funeral, in order to save your loved ones the worry at what could be a difficult time, please don’t hesitate to contact one of the ministry team. Our clergy and Lay Readers can all offer support for the bereaved and all have a special understanding of bereavement.